Alongside the Coupé, the MINI Roadster Concept just dropped its form-fitting top and, thanks to removal of the rear seats, is ready to accept loads of up to 8.8 cubic feet in its now-larger trunk. Also, it has "Buddy Radar." Have a hard time locating fellow aficionados of MINI motoring amid a sea of poorly dressed SUVs? That's where the "Buddy Radar" comes in, helping Roadster drivers cruise for others seeking pleasurable motoring. There's also a heart beat indicator, which lets you know when the Roadster Concept's all hot and bothered. Seriously, we can't make this stuff up. Jokes about Gaydar-like "Baydar" aside, we're told to expect this, along with the Coupé, to become full-production models expected to go on sale sometime in 2011. 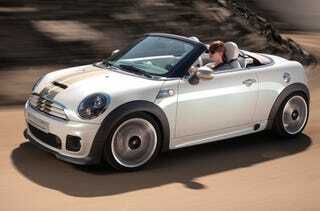 Woodcliff Lake, NJ – September 15, 2009... MINI Roadster Concept: fresh ideas for an intense driving experience. MINI evokes new fascination and a wonderful new experience time and again. For each model in the range offers unique opportunities to enjoy supreme driving pleasure and unmistakable style. From the start the concept car naturally considers the possibilities to use the advanced engines available in the MINI range – engines which stand out through their dynamic power and the efficient use of fuel. The superior efficiency of the engines is indeed combined from the start with a whole range of further efficiency-oriented technologies created as part of the BMW EfficientDynamics development strategy and featured by MINI as MINIMALISM to guarantee enhanced driving pleasure on even less fuel and lower emissions. Presentation of the MINI Roadster Concept in the anniversary year of the brand combines a retrospective view of the brand's highly successful history with the great appeal of the current model range to offer a wonderful outlook into the future. Introduction of the classic Mini fifty years ago hailed the advent of a revolutionary vehicle concept destined for ongoing fame and popularity for decades to come. Now the current models in the MINI range interpret the traditional values of the brand in modern style, setting the standards for driving pleasure, premium quality and individual flair in the small car segment. And as a vision demonstrating the ongoing flexibility of this unique character, the MINI Roadster Concept clearly presents the exceptional potential of the brand both today and in the future. The new two-seater measures 3,714 millimetres (146.2") in length and 1,683 millimetres (66.3") in width. Height of the car is 1,356 millimetres or 53.4". These dimensions, together with the special contours of the rear end, provide truly unique, sporting and dynamic proportions. At the same time, again reflecting the typical look of the brand, the MINI Roadster Concept comes with extra-short body overhangs front and rear accentuating the athletic stature of the car and alluding even at a standstill to the unique handling characterised by thrilling agility and lauded as that unparalleled go-kart feeling. While on the MINI Roadster Concept the chrome radiator grille is the same as on the MINI Cooper S, the inner section of the grille comes with bars in body colour at first sight distinguishing the MINI Roadster Concept from the other members of the MINI family. A further point is that the bonnet stripes continue into the radiator grille to provide an additional sporting feature. An attractive combination of design features typical of the brand and brand-new highlights also characterises the side view of the MINI Roadster Concept. The front side panels come directly from the MINI Convertible, just as the diagonal body joint so characteristic of every MINI between the engine lid and the side indicator surround again in the same style as on the MINI Cooper S provides an unmistakable sign of distinction with historic roots. The classic Mini was characterised here by a visible welding seam on the body. The unusually large and generous luggage compartment beneath the short rear end in typical roadster style offers lots of space for a car of this kind. Deliberately creating the car without a rear seat bench, the designers of the MINI Roadster Concept offer additional options to take along even large and bulky objects in the luggage compartment, thus optimising on the benefits offered by a compact roadster with this concept. This single-piece aluminium bar spanning the entire width of the interior and moving up electromechanically when required within 150 milliseconds, together with the reinforced windscreen frame, provides maximum occupant safety as part of the passenger cell. In its resting position the rollbar does not extend beyond the headrests, thus not obstructing the driver's visibility to the rear. And designed as a single-piece element, the rollbar allows full integration of the through-loading connecting the luggage compartment and the passenger compartment. The MINI Roadster Concept therefore addresses in particular a young and modern target group wishing to enjoy the full pleasure of driving in the open air as part of their active lifestyle, showing their appreciation of a premium car and the individual style of the MINI brand. The sophisticated character and quality of this two-seater is clearly expressed not only by the harmonious and typical design of the exterior, but also by the high standard of craftsmanship, high-class materials and an exclusive range of colours within the interior. Wide-opening doors offer the driver and passenger convenient access to the interior where they will enjoy sports seats with ample, high-quality padding in Lounge leather. A three-spoke leather sports steering wheel complete with multi-function buttons ensures smooth steering even in tight bends and on winding roads, as well as safe and easy operation of the car's audio and communication functions. All other control elements are arranged ergonomically for convenient use, taking the frequency of their operation into account. The rev counter on the MINI Roadster Concept again comes directly behind the steering wheel, with the speedometer forming part of the central instrument in the upper section of the centre console. Well-known as the Center Speedo, this striking instrument also comprises the audio system as well as the car's entertainment and navigation functions. This additional instrument is activated as soon as the driver starts the engine and completely opens the soft top of the car. Apart from the Always Open function, this control instrument comes with five further indicators again typical of MINI, combining the driving pleasure of the MINI Roadster Concept with sustainability and a feature typical of the MINI Community: The Nature Guard function tells the driver how efficiently he is driving at the moment and whether the position of the gas pedal is appropriate for the speed at which the car is travelling and the gear selected. At a glance, therefore, the driver can see how to save fuel. Should the driver wish to enjoy maximum performance, on the other hand, the Highspeed Shifter gear indicator tells him when and how to use the maximum power of the engine. Supplementing this performance program, the Gravity indicator presents the lateral forces, g-forces and the direction of acceleration acting on the driver and the car. Heart Beat, to present the next example, visualises the speed of the engine by referring to the human heart beat as a yardstick: The more sporting the driver's style of motoring, the faster the heart will beat. Buddy Radar, finally, is a MINI Community feature showing the driver where other MINI drivers are currently out on the road nearby the MINI Roadster Concept. With its current model range, MINI already sets the standard for driving pleasure going far beyond the small car segment. And now, in its purist form, the MINI offers all the character of an agile performer with supreme handling in bends and on winding roads. The MINI Clubman and MINI Convertible, in turn, combine the unique handling so typical of the brand with their own distinctive features and qualities. Powerful engines and suspension technology far superior in the small car segment ensure a unique driving experience under all conditions, front-wheel drive, powerful disc brakes on all four wheels, the front axle with McPherson spring struts and a central arm rear axle with aluminium longitudinal arms and anti-roll bars providing the foundation for unparalleled safety and agility on the road. EPS Electronic Power Steering with speed-related power assistance enables the driver to steer precisely through bends, providing consistent feedback on road surface and driving conditions. At the same time on-demand variation of power assistance helps to make the car even more efficient. Equipped with this kind of modern drivetrain and suspension technology, the MINI Roadster concept would be perfectly suited to provide a new and very appealing rendition of that go-kart feeling so typical of the brand. Doing without a fixed roof and introducing appropriate body reinforcements instead, the shift in weight on the car enhances its agility to an even higher standard. This, in turn, noticeably reduces body movements and optimises the car's steering behaviour in bends. Traditional values, modern quality, future-oriented concept. Practical qualities, sporting talent and a high standard of all-round economy have helped to ensure the popularity of the brand over no less than five decades. Representing the epitome of modern lifestyle, this small car has indeed become an outstanding success the world over. Through all these years and decades MINI has re-invented itself time and again, always remaining faithful to its underlying philosophy. The anniversary year is therefore the ideal time to present the MINI Roadster Concept as yet another look into the future of the brand. This, therefore, is the vision of a sporting two-seater combining sophisticated design and exclusive features with spontaneous driving pleasure under the open sky and the uncomplicated enjoyment of premium motoring. The traditional values of the brand also help to give the MINI Roadster Concept its unmistakable character, modern drivetrain technology providing further opportunities to combine an even higher level of performance with efficiency optimised to a new standard. At the same time the innovative concept of the car caters for the challenges of the future, offering a clear focus on both driving pleasure and all-round quality. So where less is more, the MINI Roadster Concept is a supreme rendition of purist design, offering style and enthusiasm of the highest standard.